TRINITY – The Crockett Bulldogs left no doubt in their 57-21 district opening win over the Trinity Tigers on Friday night. Crockett scored on six of their first seven possessions of the night, roaring out to a 43-7 halftime lead, before putting away the Tigers in the second half. Most impressive in the Bulldogs romp was how quickly they were able to light up the scoreboard. Crockett needed four plays or less to reach pay dirt on five of their scoring drives. 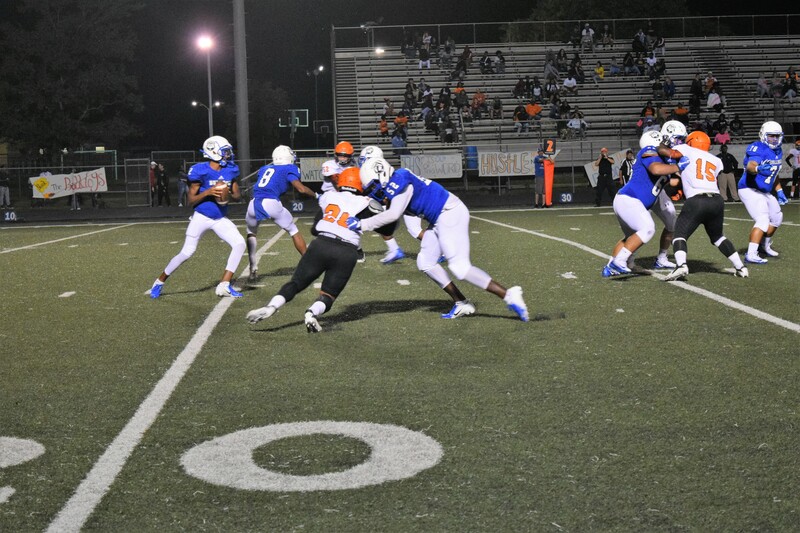 Junior quarterback Jordan Beford helped pilot the Bulldogs offense to such an explosive start. Bedford was an efficient 10-16 passing for 169 yards and four touchdowns. All touchdown passes were to a different receiver, as the Bulldogs were able to spread the ball around to a plethora of weapons offensively. Crockett rolled early, putting up 29-straight points to open the game. On top of two Bedford touchdown passes in the first half, Alton Owens returned a punt 45-yards for a touchdown, and Joseph Porter rushed for a nine-yard score to help Crockett take an early 29-0 lead. Trinity would finally get on the board at the 8:42 mark in the second quarter with a 74-yard pass from Grisham Vaught to Treylin Goodman. Crockett would respond in a big way, scoring 28-consecutive points to take a commanding 57-7 lead. 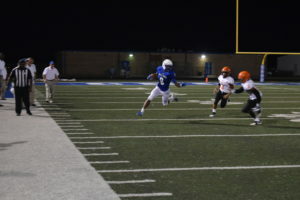 Bedford continued to be the engine, throwing two more touchdown passes, including a 26-yard pass to Demarcus Richardson and a 9-yard toss to Cristian Brice. Joseph Porter added a 10-yard touchdown run in the fourth quarter, but the exclamation point came on a 70-yard pick-six by the Bulldog defense. Trinity would add a pair of touchdowns late, but the damage was done with Crockett rolling to a district opening victory. While a 57-21 victory would lead many to believe Crockett had eye-popping numbers offensively, that was hardly the case. The Bulldogs finished the night with just 275 yards of total offense with Bedford leading the way. The junior quarterback completed 10-14 passes for 169 yards and four touchdowns with one interception. Bedford also rushed for 23 yards on three carries. Four different Bulldogs ended the night with at least one reception. Richardson led the team with four catches for 51 yards and a touchdown. Allen Horace had a modest night with two catches for just 31 yards. Alto Owens, who leads the Bulldogs in several offensive categories, finished with one catch for 31 yards and a touchdown. Crockett had their best night of the season running the ball, carrying the ball 20 times for 106 yards as a team. Malik Johnson led the team with nine carries for 56 yards with Porter adding 23 yards and two touchdowns on four carries. Another rival awaits the Bulldogs on Friday night, as Crockett will travel to face the Diboll Lumberjacks. Diboll enters Friday’s contest with a perfect 4-0 record on the season, but has not played a district game this season. This game will hold major playoff implications for each team, as both find themselves vying for a spot atop the district. A win will give either team a massive boost atop the standings with Franklin still looming ahead. Kickoff is scheduled for 7:30 pm from Lumberjack Stadium in Diboll. Check back in the Messenger for pictures and a complete recap of the Bulldogs district showdown against the Lumberjacks.